Friday Fun: Mighty Morphin Power Rangers Reboot? Comments Off on Friday Fun: Mighty Morphin Power Rangers Reboot? Like many kids, I was a power Ranger fan and now, as an adult, I have a totally awesome Mighty Morphin Power Rangers reboot by Joseph Kahn! Well…sort of. It is only a dream but I want to believe. More info about the inspiration in this funny interview with Adi Shankar. Last Night is a short, moody, cyberpunk adventure game in the spirit of Flashback & Blade Runner. It’s pretty fun! Ok maybe this technically isn’t fun but it was kind of funny. The Finnish record industry lobby is trying to discourage piracy via a series of so bad its good videos. I guess some cultural minister thinks that this music is great. It’s certainly no Don’t Copy That Floppy! Comments Off on Friday Fun: Circuit Stickers! At first glance, you might think that the Anonymous story — the Guy Fawkes-mask-wearing, meme-spewing, terrifying, hilarious non-collective that hacked the church of scientology, the government of Tunisia, the Serious Organised Crime Agency, and the Pentagon (for starters) — is a story about computer security, or youthful alienation, or political activism. Read the rest here. Role-playing game historian Jon Peterson reviews twelve rare artifacts that grant us unique insight to the initial development of Dungeons & Dragons. They include original documents from Braunstein, an early letter from Gary Gygax on the medieval setting, Dave Arneson’s notes for his own early medieval game, fanzines and maps associated with the Castle & Crusade Society, and various pre-publication D&D rules. Back in 1991, brothers Rand and Robyn Miller led a team at Cyan, Inc. to create a puzzle-adventure game would change the face of PC gaming forever. Its unique premise, simple mechanics and beautiful artwork made MYST one of the best-selling PC games of all time. Now you too can have your very own MYST Linking Book courtesy of SparkFun! 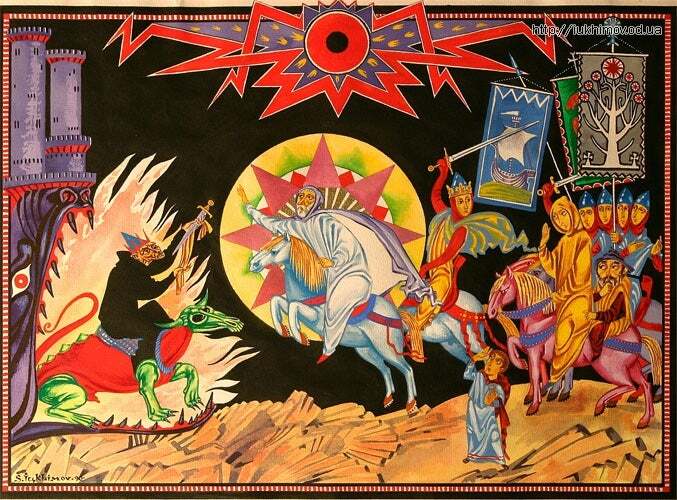 Wonderful and strange illustrations of Tolkein’s works by Ukrainian artist Sergei Iukhimov. Really amazing!